God's Grace Overflows: Did You Know? They can be sweet and sometimes a little tart. in a muffin or bread, in a smoothie. fruits are so good for you. building and maintaining bone structure and strength. the strength and elasticity of bones and joints. absorption and may reduce calcium loss. , lipids and insulin levels. contributes 3.6 grams of fiber. its lack of cholesterol, all support heart health. and decrease the risk of heart disease. that help protect cells against free radical damage. pharynx, endometrial, pancreatic, prostate and colon. resulting from cell death in parts of the brain. regularity for a healthy digestive tract. by functioning as a "bulking agent" in the digestive system. lowering your overall calorie intake. 24% of your daily need for vitamin C.
Now, I think I'll have some yogurt! I hope you all have a Delightfully Bright Day! I think we going to put in a couple of blueberry plants this year. Hopefully save us some money as Megan could snack on a pint each afternoon! I did know that blueberries are very good for you...and that's a good thing because I just love them! I especially like them in muffins and pancakes! :D I hope you have a great week! Hey, What a great informative post! Those tiny cute blue blueberries are a powerhouse packed gem. I also love them and I eat them often. I do like them in my yogurt, but your blueberry bread is the best! I love blueberries too! I did know they are really good for you, but didn't know some of the info you shared. 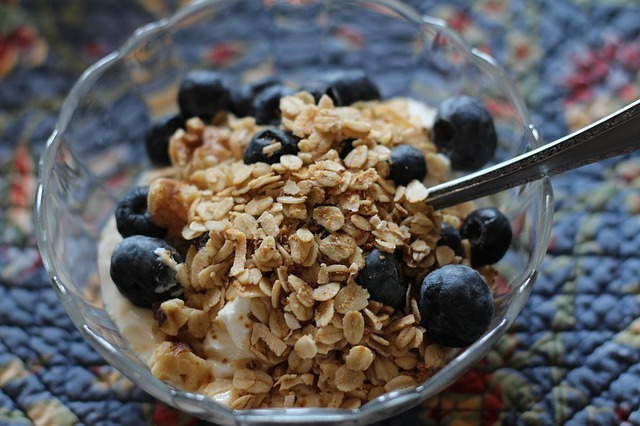 I love fresh blueberries on yogurt with some granola. Yummy! Hope you had a wonderful Monday. Love blueberries! They are worth the extra time to pick!! Hi Amy, I've been meaning to get here all week(days escape me)- I want to see how life is for you with a new pup. I'll go back to your previous post. I love blueberries and get them whenever I can. I didn't know many of the facts you shared thou, just know I love them and they are good for us. Thanks for sharing. Btw, I seem to have missed your moms blog-can you share her blog name against n.